Alice Ruth Killingray fought back tears of grief and rage with trembling as she stared into Okoyi’s eyes. She had been a mother to Alice since she was nine-years old after she had been abandoned for a second time because the Wanawake, the mysterious tribe of women warriors, had once again defended the sacred national treasure they called the Eye. Josiah Cohen and his band of mercenaries let her hire on after Okoyi cast her out when she was nineteen. She knew the secret to her parent’s fate was tied to the Eye and the transparent, rectangular sheet of glass containing the carved Runes not even the Wanawake understood. But as she grew, she realized Daddy knew. He was a missionary sent by the Methodist Episcopal Church to preach the salvation of Jesus to an all but unknown tribe in the remotest part of the African continent. He had gotten government permission to build their house in the Wanawake sanctuary and he placed it as to encompass the Eye and the Runes. Daddy was a missionary but he was also a linguist and musical composer and felt that understanding the Runes and the artifact, whatever it was, could be the key to reaching the Wanawake who he discovered wanted nothing to do with the Christian God. But he had made a horrible mistake in violating their most sacred taboo. Daddy thought that because the Wanawake never visited the Eye, that they ignored it or thought it irrelevant to their current lives. In fact, they did observe the Eye from deep cover, but only once a year, since it was thought to be so sacred that no one should violate its presence with any more frequency. When they found out the white missionary had the audacity to construct his dwelling around the Eye, their rage was a pride of lions. Alice was only five years old the night they attacked. She heard the shrill and terrifying war cries, saw the fierce, painted women of the Wanawake bursting in through every door and window wielding spears and long knives. Mommy tried to pull her after Daddy. He was leading them to the back of the house, the room he built around the thing. Mommy was screaming, “Alice! Alice!” The world went dark for the little girl and she didn’t remember anything after that. Alice didn’t talk for years, she only sang her strange little song. A patrol of white soldiers found her standing in the middle of the jungle alone. They didn’t know who she was or how to contact any relatives so she was locked up in a sanitarium. Somehow Marcus Leech found out about her, the miserable thief. Pretending to be mad, he had himself committed to the sanitarium. Clever man, he managed to get to her, convince her that Mommy and Daddy were still alive, and that he could take her to them. Leech stole her away and she told him and his band of thieves the way into Wanawake country so they wouldn’t be observed and how to find the Eye. The man who liberated her turned out not to be a friend. He only wanted what he thought was riches. The Wanawake had started putting gold next to the Eye in tribute rather than inside because they couldn’t open it. Leech thought she could, that the Runes were the key. All she could remember was her Daddy singing to her every night with that magical and playful tune she thought he made up. Leech slapped her when she wouldn’t sing. He figured it out. It was the song that opened the Eye. Not even the Wanawake knew that, but they knew that Alice had come back with more trespassers. This time, no one went into the Eye and no one escaped. Only the nine-year-old little girl was left alive, but she was not allowed to go back to the white men for fear she’d lead even more to into their realm. She grew up as one of them, was taught the ways of the Wanawake, became a warrior as fierce and as feared as any who had been born among them. In time, she forgot the song, but she never forgot Mommy and Daddy. Finally, she worked up her courage to ask Okoyi to let her go to the Eye and to see the Runes. If there was a chance to find them again, it was there. Okoyi refused. Alice insisted. Alice was old enough to decide her fate and she did. She left the Wanawake dejected and alone rather than continue to live among them while they denied her even they tiniest hope of seeing her parents. For ten years she ran with Cohen’s mercenaries, taking every dirty little job that came their way. She was the only woman and one of the best fighters. In the first weeks after she signed on, some of the men thought she could be had. She killed one outright and emasculated another. Since then none of Cohen’s men had come near her. They called her “Killing” as both a play on her name and what she was best at. Then a few weeks ago, the dreams came back. It was the song. She was starting to remember. She also remembered they were close to the government reserve. The sacred Land of the Wanawake was forbidden to all white men, but the President issued that edict only after five separate attempts at invasion by his Army, all of which resulted in the mutilation and death of every soldier to cross the border. It took a lot for Killing to convince Cohen to violate the sanctuary. He wasn’t greedy so gold alone wasn’t a temptation, but he was ambitious and clever. To do something no one else had done and live to tell the tale, to steal the treasure of the Eye…it would cement his reputation in the sub-continent and forever make him a legend. So they invaded. The Runes had been separated from the Eye but Alice managed to retrieve them just long enough to realize she didn’t need them anymore. She remembered the song, all of it. The house Daddy built had been burned to the ground but the Eye as always remained. Killing and Cohen’s Freemen, for that’s what they were called, white and black alike. stood before the Eye. An obscene amount of gold was piled around it but Killing knew the real treasure was inside. So did Okoyi and the Wanawake as they surrounded them. Alice stared past Okoyi at the Eye. It was actually a perfectly round disc about six feet tall. It was black but not because it was made of something black like stone or glass. It was the essence of darkness, the very character of ebony, something that should be impossible and yet here it was for all to see. When Alice was very little, she once snuck into the room with the Eye and touched it. It was hard and cool but it didn’t feel like anything Alice had ever felt before. Terrified, she crept back out of the room and into bed before Mommy or Daddy caught her. Alice closed her eyes and parted her lips. She began to sing. Okoyi would either let her finish the song or she would die with music in her heart. Cohen and his men watched the Wanawake women closely. They had been forced to disarm when they realized they were surrounded and the odds were against them, but now each of the warriors seemed mesmerized by the singing. The merc looked down at the rifle just a few feet away. He gave a quick nod to his men which was all they needed to understand his plan. As a single body, Cohen’s Freemen lunged for their guns as the Wanawake, who were aware of everything happening around them, each pressed one or more spear tips to the throats of the mercenaries. Alice stopped singing but the song continued. It was coming from the Eye. It was opening and instead of black, there was a shining light. Finally the woman called Killing would know the truth. It was a truth she never really knew before. Cohen’s Freemen and the Wanawake would discover it with her. Then the adventure would finally begin. I wrote this for the Song Lyric Sunday Theme for 2/4/18 challenge hosted by Helen Vahdati. The idea is to post the lyrics to a song that matches this week’s theme word. The word for Sunday the 4th is “Truth”. What is the explanation? Who knows? Then things got a little crazy. I looked at other sources for the song’s lyrics and most of them stated it’s an instrumental. What? Finally, I just went to YouTube and played the full version of the theme. Sure enough, there were lyrics, but just a single line repeated at intervals. As near as I can figure, it says “You really don’t know” whatever that means. Last night I had a dream. You just read part of it, well sort of. My story is set in the late 1920s or early 30s when the continent of Africa was still largely an unknown. I had recently read an article about the basis for the Amazon legends called Meet the Most Feared Women in History which provided a brief chronicle about the N’Nonmiton (which means “Our Mothers”). 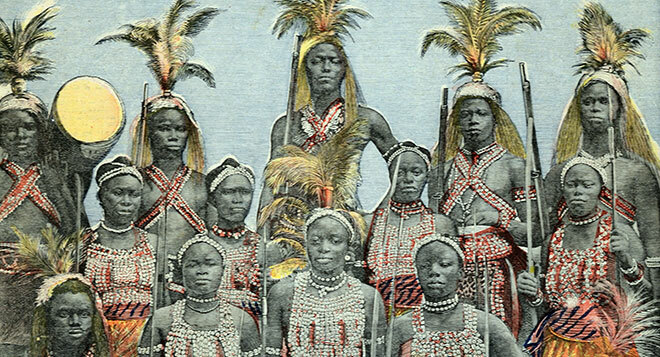 I also did a bit of research on early 20th century missionaries to Africa and discovered that the Swahili word for “the woman” is “wanawake,” which is the name of my fictional tribe of warrior women. The full story, in addition to being a lot longer, is a lot stranger, since part of the reason a colonial government created a reserve around tribal lands rather than go in with everything they had and exterminate them was that the laws of physics are somewhat unpredictable as you get closer to the Wanawake. I know. Not really in the spirit of Helen’s challenge, but it certainly seemed interesting to me. I hope to develop this tale by the by and perhaps there’s a periodical or other venue of mystery, supernatural, or metaphysical short stories where I could submit it for publication. I think it’s that good and that unique. I’d love to read more! The Wanawake have my attention! Thanks, Felicia. As I mentioned in the Afterword, I have a larger tale in mind but it’ll take time to develop. I listened to the X-files theme music, and the single line of whispered “lyrics”, if it can be called that. It really seemed to function musically as a percussive element rather than a lyrical one. The line is a question: “Do you really wanna know?”. On another note, your story is compelling. It resonates with the “Stargate” universe, in some degree. I’ve seen the original movie “Stargate” but none of the television series. Thanks for clearing up what I was hearing. It wasn’t very clear to me. best wishes as you keep the story developing..
My dreams have always been entertaining. Sometimes they’re the best part of my day. Thanks. Some dreams make good stories, most make no sense at all, and a few are just too nasty to consider. I’ve always had really vivid dreams, but nothing quite so fascinating as yours. It was an interesting read and I loved your back story on it. The X-files theme song is strange, but it sort of fits the narrative of “what is truth and is it really out there.” Great stuff this week! Thanks so much for sharing and participating! Thanks, Helen. Now if I can only find the time to circle back and develop the story (and all the other stories I’ve left on the back burner).